Thursday January 30th 1890 We ironed this forenoon and done up the other work. Winnie feels some better and Will is at work today. Mother and I went to town this afternoon and Ott made out the lease for the west farm. I loaned the firm $500.00. It was supper time when we got home. I knit in the evening. weather pleasant today. Friday January 31st 1890 I was busy about the work all forenoon. I did considerable sweeping and some mening in the afternoon while Mother was gone to town. Winnie feels some better today. Will sold twelve hogs this morning that brought $100.64 he went to town in the afternoon and paid the taxes which were over sixty dollars. he went to town again in the evening. I knit in the evening. had a letter from Will Work. 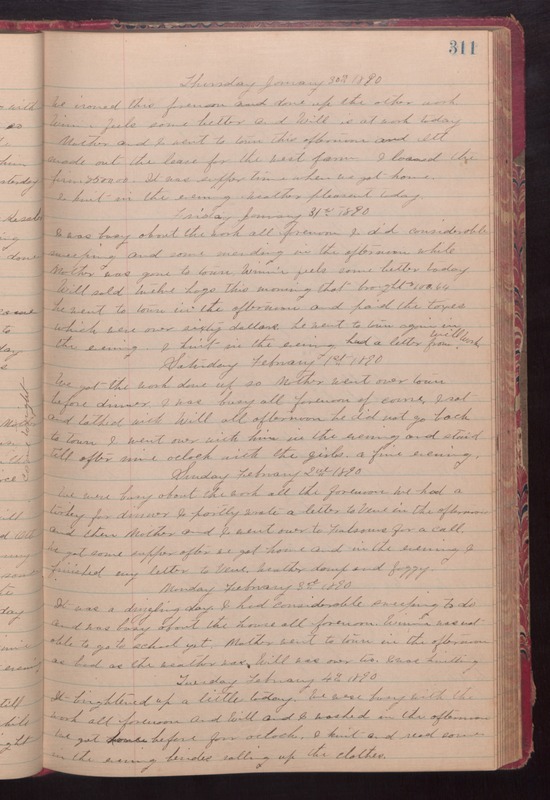 Saturday February 1st 1890 We got the work done up so Mother went over town before dinner. I was busy all forenoon of course. I sat and talked with Will all afternoon he did not go back to town. I went over with him in the evening and staid till after nine oclock with the girls. a fine evening. Sunday February 2nd 1890 We were busy about the work all the forenoon. we had a turkey for dinner. I partly wrote a letter to Vene in the afternoon and then Mother and I went over to Folsoms for a call. We got some supper after we got home and in the evening I finished my letter to Vene. weather damp and foggy. Monday February 3rd 1890 It was a drizzling day. I had considerable sweeping to do and was busy about the house all forenoon. Winnie was not able to go to school yet. Mother went to town in the afternoon as bad as the weather was. Will was over too. I was knitting. Tuesday February 4th 1890 It brightened up a little today. We were busy with the work all forenoon and Will and I washed in the afternoon. We got home before four oclock. I knit and read some in the evening besides rolling up the clothes.